We’ve got an amazing treat for all you dog lovers out there this month! 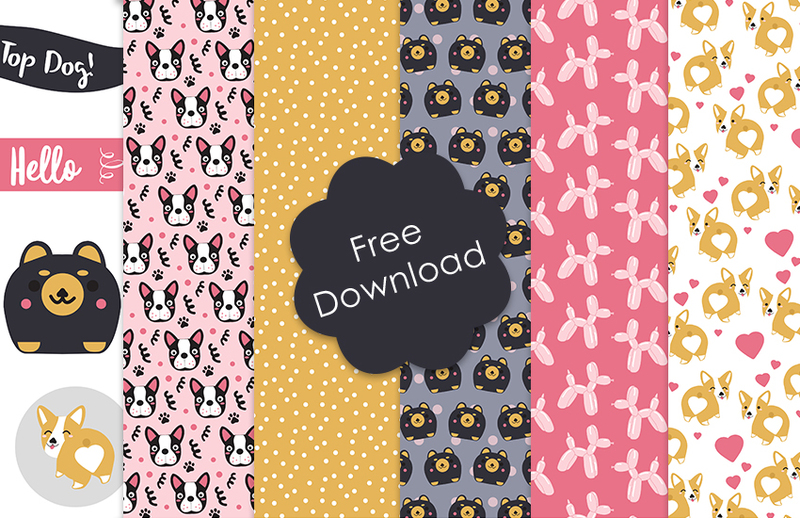 We’ve put together an adorable pack of papers that you can download and print for free! Featuring cute Corgis, friendly Frenchies, paw prints, polka dots and more, there is no end to what you can create! You’ll have so much fun using this woof-ly selection of papers. Download our Free Dog-themed Papers Here. 1. Download our free papers and print out the sentiment page and your favourite designs! 2. Using your chosen design, trace around your notebook (Don’t forget to include the width of the spine). Draw a 1 inch border around the actual size of the notebook so you can create flaps to fold in and cut this shape out. 3. Adhere the notebook to the middle of the paper leaving the 1 inch border free. Using a scalpel, cut small lines at each corner of the notebook. 4. Using perma-fix, fold and stick these flaps to the inside of the notebook. 5. Using a contrasting design, cut a 2inch x 1 inch rectangle and adhere to the front of the book. 6. Finish your notebook with a Top Dog sentiment and an adorable Corgi! Now you have your very own adorable notebook and you can personalise it any way you like! This is perfect for storing important information about your pets, vet dates or even keeping track of tricks. Why not create something else? Here we’ve used these paw-some papers to make a little doggy shelter treat box and a sweet card everyone is sure to love! How will you use our free paper download? We’d love to see you lovely creations so don’t forget to upload your versions to the Inspiration area and #Trimcraft when sharing to social media! Most importantly, stay inspired and keep crafting! It won’t allow me to download the free papers - saying unable to render file? What do I do? This is so cute, and thanks sooo much for doing something with dogs here this time. I´m a dog person and think most we´ve seen this year has all been about cats, so it´s really nice to see something with cute dogs too. And these are really cute, so thanks sooo much.